Are you ready for another quick make? 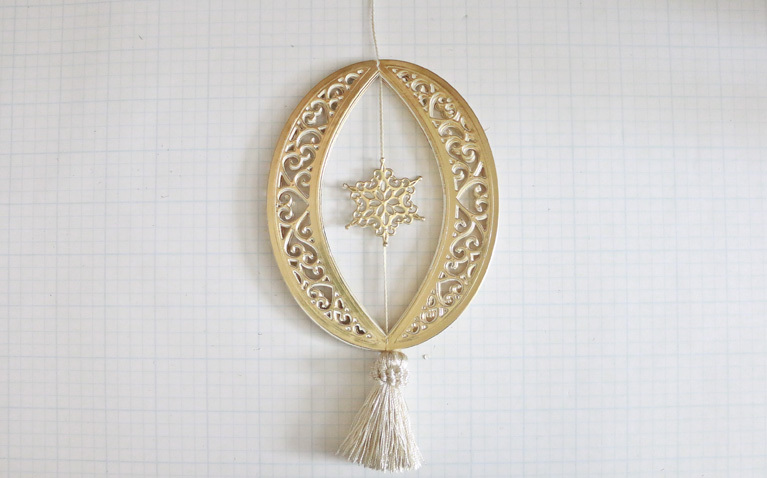 This month I’ve been showing you how to make die cut ornaments for gifts, for fun and as a part of a family activity. 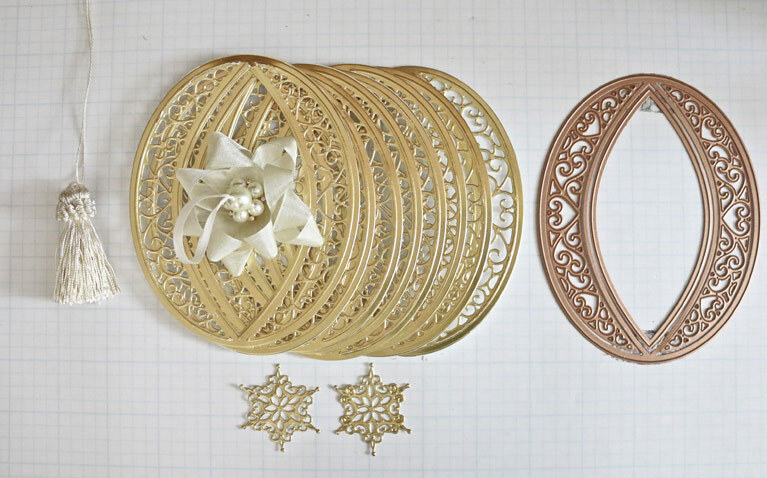 I’m Becca Feeken with Amazing Paper Grace and I’m back with the third in a three part series on Diecut Ornament Making. 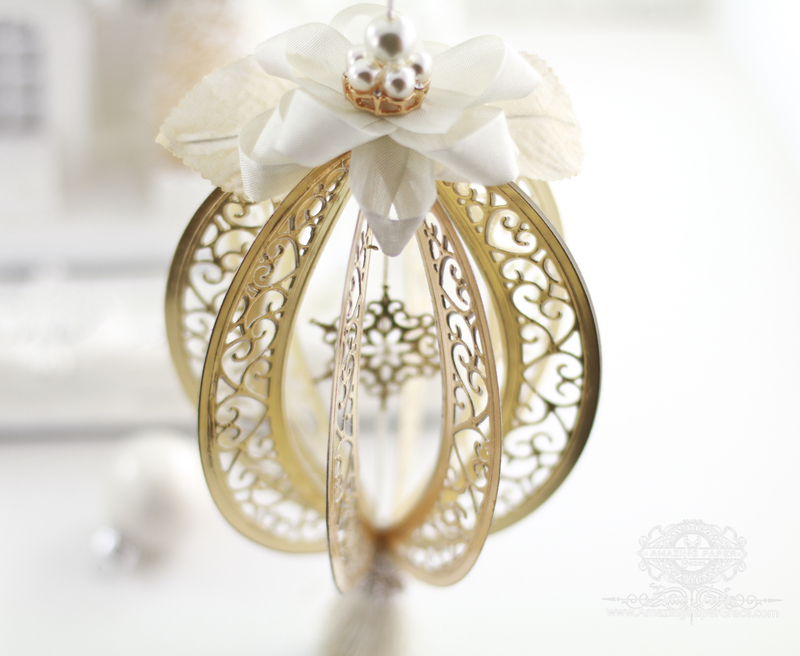 Today I’m going to show you a round, eight gored ornament using S6-129 Bella Rose Lattice Layering Frame. If you missed my post with Ornament 1 in the series, click HERE, Ornament 2 in the series, click HERE. Because there are three sets of inserts that fit this die, that means three different looks of the same ornament! The matching arched inserts I chose were from S5-330 Lunette Arched Borders where I picked the heart motifs. 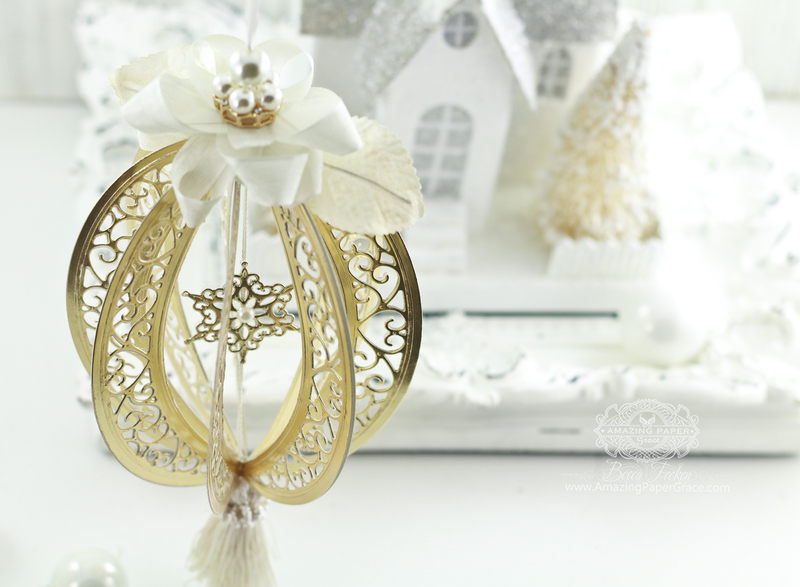 This is another ornament that goes together quickly. Once again, finding the button I wanted to use on top took longer than actually gluing the pieces together. 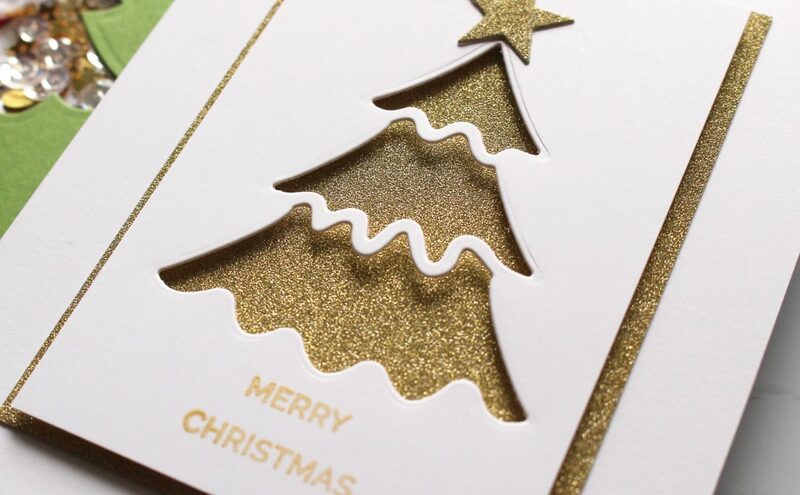 Although I used one color of card stock, alternating two colors would make a lovely ornament as well. Fold all eight ovals in half, rights sides together. Using Glossy Accents, glue all eight folded elements together. Do this by placing one folded element on table, glue exposed top and stack another element on top of glue. Repeat until all eight pieces are finished. Glue snowflakes back to back on thread with tassel and glue thread to edge of stack. 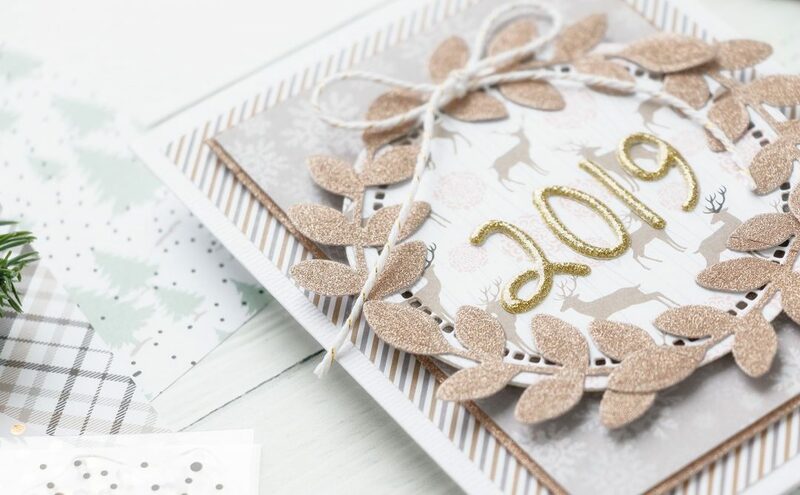 Gold Foil Cardstock, Ranger Glossy Accents, Seam Binding, Decorative Button, Decorative Leaves, Pearl Cotton Thread, Hot Glue Gun. I love finding projects using dies, other than what they were originally made to do. 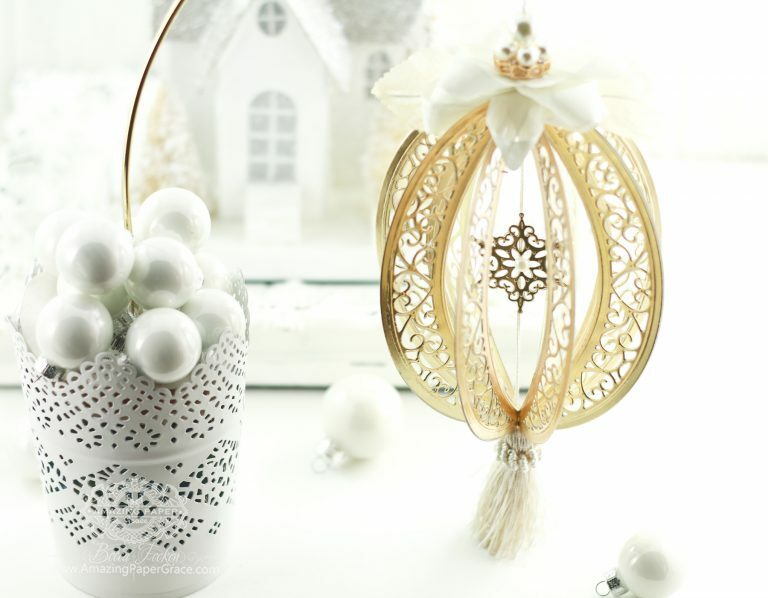 Handmade ornaments are like the icing on the cake. Have a look in your stash to see what you can repurpose for your tree! Oh, Becca. This is absolutely gorgeous!!! You are such an inspiration. I don’t know how you thought this up, but it is just so beautiful and elegant. Thank you so much for the tutorial on how you made it. Brilliant! Thank you Chelsea!! Lol, much to everyones chagrin, I design dies slowly because I like to marinate on whether I’m packing enough into what it can be used for. This particular die missed an earlier release because I just didn’t think it was ready. I will say that I’m feeling better about the long thought I put into making sure it is purchase-worthy. Thank you so much for your kind words on this! An awesome Christmas ornament. Just lovely! Thank so much Suzzie!! 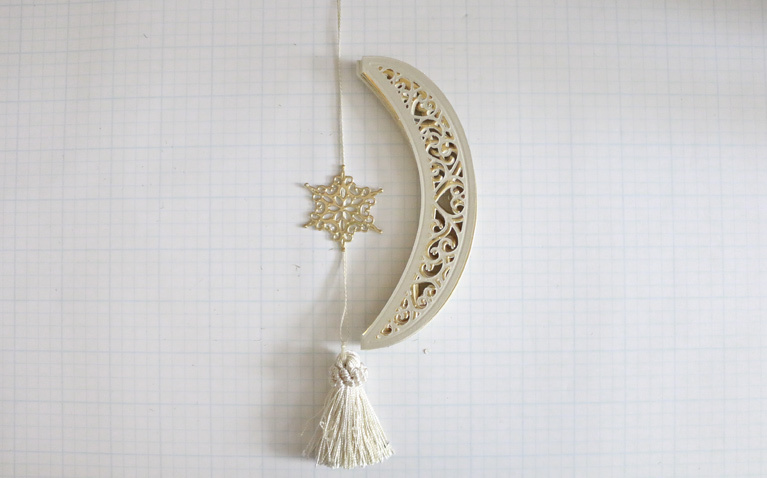 Many of these ornaments have been on my “must make” list for a while and then I think, would people want to see it? I thank you for your kind words – I might make a couple more!! Lovely ornament. 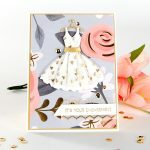 Becca has such lovely dies, love her work. Christine (one of my sweetest, long time readers) thank you so, so much for your kind words here! I hope you are doing well! Thank you my sweet friend! I hope you’ll give them a try!! 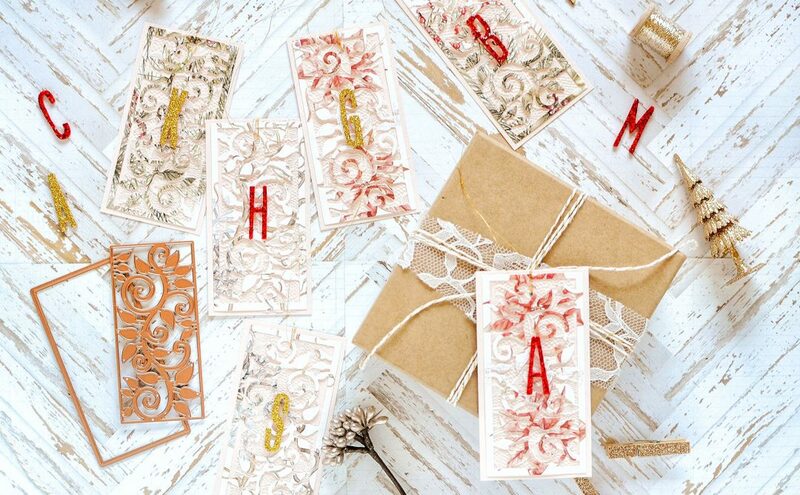 I just received my Chantilly Lace dies this morning from Hope and Chance Creativity in the U.K. Will be surprising my friends this Christmas. Thank you Becca, one again, for the inspiration you pass on to us weekly. Thank you so much Joyce, my pleasure! So glad Christine had them and could get this in the mail to you!! Hi Denice! Thank you so much for popping over and glad you liked the ornament. It’s not hard and I’m contemplating making with some kids 🙂 God bless you too sweet friend! I love what you’re doing with the dies to make ornaments. I ordered a die just for that reason as the ornament was so pretty. Thank you for your inspiration and I’m sure that the people receiving my ornaments will love them. You have such wonderful products. All of your dies make beautiful greeting cards for me to give and sell. Sweet Patricia, you and the other readers here absolutely made my day! I work alone and sometimes wonder if I’m on the right track. Please reach out to me if you need any help in putting these together. Overhwelmed that I’m in lots of places, but the best place to get my attention is on Instagram – I’m there as amazingpapergrace – you can either message me or ask me to get in touch with you. Finally, thank you so much for your sweet words!! 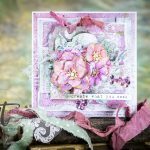 the other side of the WORLD ……..
with her work on SPELLBINDERS BLOG love it ! Thank you Pam, so glad you can get them and thank you for your kind words! Let me know the name of your retailer so I can give them a shout out!! 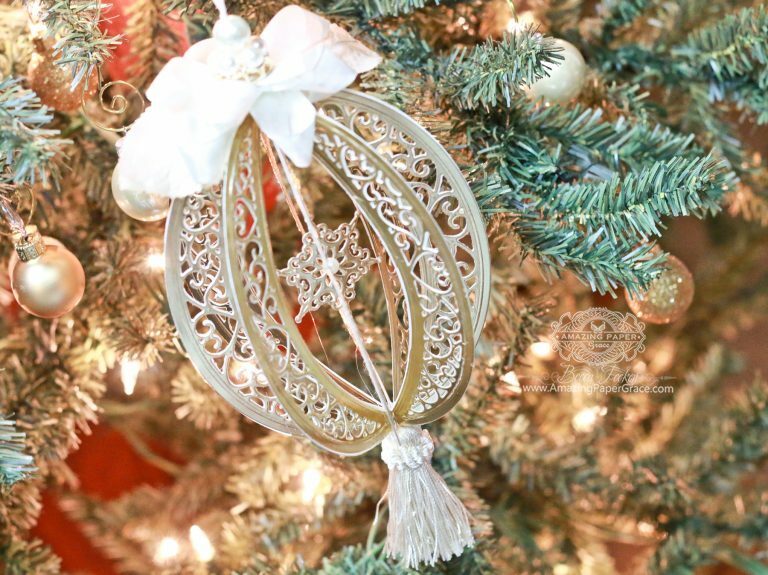 Gorgeous ornament, Becca! Using a regular die no less! But of course, you have been challenging us to make ornaments using dies since at least 2010, when the Heirloom Ornaments were introduced. That was when I began following you on the Spellbinders blog before adding your own blog to my daily inspirational friends must-see list. Lol. I have so many ideas and not enough time. Thank you for sharing your wonderful talent & designs. Kristine, it tickles me that you remember that honeycomb ornament – it was a first 🙂 I’ve seen a lot of people reproduce my original guide and it may be time for an update!! I am thinking to bring it into the current day with a rerelease – it was fun!! Ooooh, I think that would be lovely, Beverly!! Wow Pam, I think they will make a stunning gift!! Imagine them in a clear box!! Have fun – I’m sure your friends will be tickled! Absolutely stunning and elegant, Becca! Thanks a lot for showing us how to make this beauty! Bente – thank you for your sweet, sweet words!! Thank you so much Charlotte! So good to hear from you!! Oh Becca! Your ornaments are absolutely stunning. I am making the second one….and plan to make the first one too! Now I just have to buy the dies for this lovely piece. Thank you so much for creating such versatile dies. 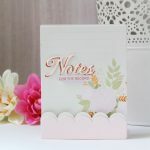 I just love the idea of branching out to create not only beautiful cards, but other beautiful things too! Thank you so much Janet! These are easy to make 🙂 I hope you’ll give it a try!! Simply put STUNNING! Becca, this ornament is just so beautiful! Keep up the great work! Oh Lori, thank you so much for stopping by and for your kind words!! What a beautiful, delicate creation! OH BECCA!!! These are breath-taking beautiful!!! I need to take a couple of dollars from my grocery budget to save up to purchase these beauties. Being disabled, I have a lot of time to do crafts. I would have so much fun with making these. THANK YOU for your inspirations, Becca. MERRY CHRISTMAS!!! Debi, I’m so glad you’re enjoying them. They really are quite easy and it’s just another bonus use of the die!! Thank you so much for your kind words and I wish you a Merry Christmas too!! Ordered this die yesterday and can’t wait until it comes! Becca is my everything designer, always look forward to receiving an email from her as I know it will be something totally breathtaking! God created this woman to be the “Queen of Crafting! !” Love you girl. Hugs! Ann, I’ll be waiting to see what you make sweet friend!! 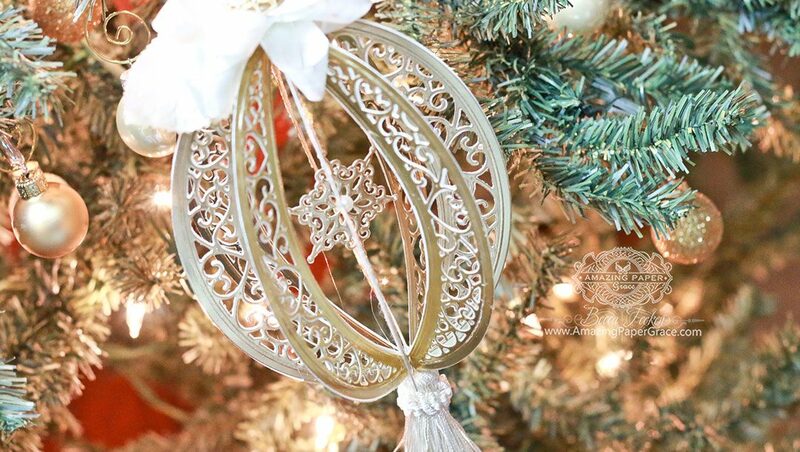 What a gorgeous ornament! Absolutely breathtaking! It looks very difficult but your instructions made it easy to follow along. 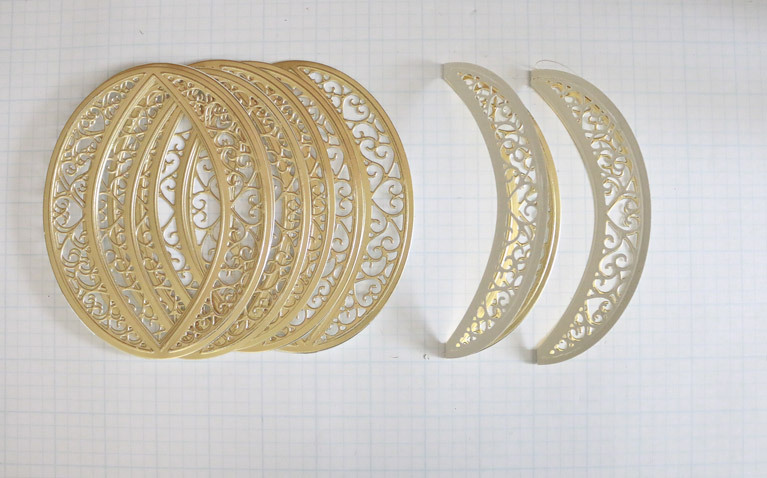 It’s amazing what you can do with string, foiled paper and some detailed dies. Beth, it is very easy! So glad you like it!! Gorgeous, Elegant Die with Infinite Creative Potential! Can be used for Wedding Centerpiece “Embellishment” as well using Elegant or Mirror or Glitter Cardstock with Love Birds or Doves in lieu of snowflake with fresh floral “base” and Gold or Silver (or colored to match theme) Aluminum Floral wire as holder in a tiered or graduated fashison.. Makes a Great birthday 3-D card as well which can be hung in one’s window or on mantle….possibilities are endless with this die.